Tony Russo was ten when his family put him on a boat in Naples, Italy with a suitcase full of salami and cheese, headed to America. Leaving behind his parents, brother and sister, grandparents, and the village that was his world, he arrived in New York to stay with relatives–strangers to him, mostly–who didn’t have the means to take him in. Russo’s struggle to survive in this alien world, his longing for his family, and his determination to be reunited with them, all draw the reader into his story. As Russo fought his way through his junior high years, a coach saw his potential as a wrestler, and changed the direction of his life. How did this boy go from the hills near Naples to a Hall of Fame? Read his story! Russo’s memoir, capably co-written with his daughter, Tonya Russo Hamilton, will engage those who love stories of overcoming adversity, as well as those who value athletics and the character-building influence of good coaching. You might enjoy the publisher’s story about the book signing at the book release party in Russo’s hometown of Newberg, Oregon. I’ve written in previous blog posts about Italian-Americans and their contributions to American life. This book continues that theme, and I recommend it to you! 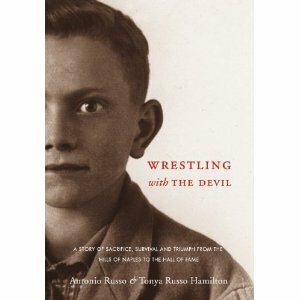 This entry was posted in Books and tagged book review, Italy, Tony Russo, Tonya Russo Hamilton, wrestling, Wrestling with the Devil. Bookmark the permalink.